Addressing the potential for insider threats is an often overlooked security imperative for virtually all organizations worldwide. Any unprotected computer poses an insider threat to intellectual property, even if the user is the most ethical employee on the planet. 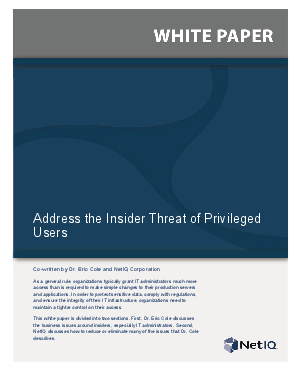 In this white paper, Dr. Eric Cole describes the defining aspects of the insider threat, its magnitude (monetization of stolen IP dwarfs that of stolen cars), and the main reasons insider threat is ignored. Cole then presents key focus areas for addressing the threat: policies and procedures, audits, and access controls. The paper concludes with an overview of how NetIQ’s products specifically address those areas as well as enable organizations to manage an increasing number of servers and applications with fewer administrators.